Blue is the most universally favored color out of them all and we can see why. Blue is unique and versatile, plus each shade of blue can mean a different thing. Blue is known to be linked with creativity, sky blue is linked to calming and helping a person relax, and dark blue is associated with intelligence and lack of emotion. 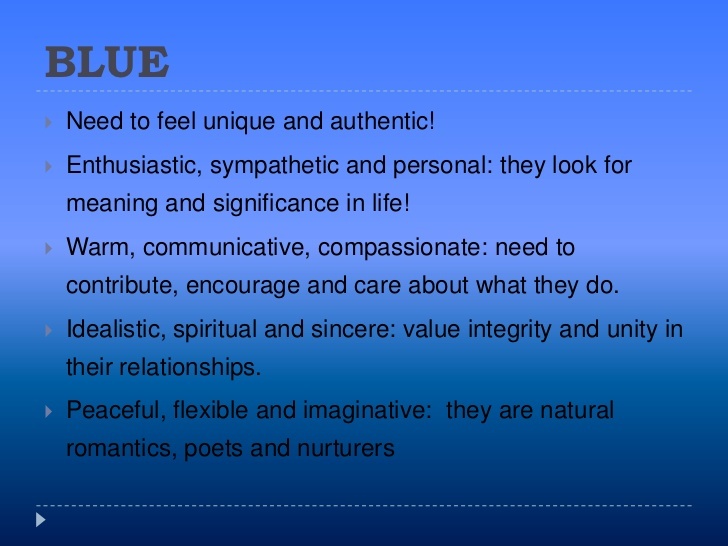 When you look at a few words that is associated with blue, you come up with words like trust, dependability, serenity, intelligence, confidence, aloofness, and unappetizing. Let’s break these words down a little more and investigate them. This two can go hand in hand. When you look at branding and marketing campaigns, companies lean towards using blue because of the psychology traits it has. The colors give the customer a feel of loyalty, which leads them to trust and depend on these companies. Looking at some popular companies, think of Ford, Dell, JetBlue, and Facebook, they all use blue in some degree to represent themselves. Blue is a color that suggests peace. The color of the calm sea and clear sky are both blue which helps promote inner serenity, calm, and clarity. Blue can also slow your heart rate and breathing, making it the perfect color to choose when mediating and relaxing. Intelligence has always been linked to the color blue. It has been proven that different shades of blue can improve concentration, stimulate thinking, and provide mental clarity. It also improves productive, making it a great color to surround yourself with when studying and working. 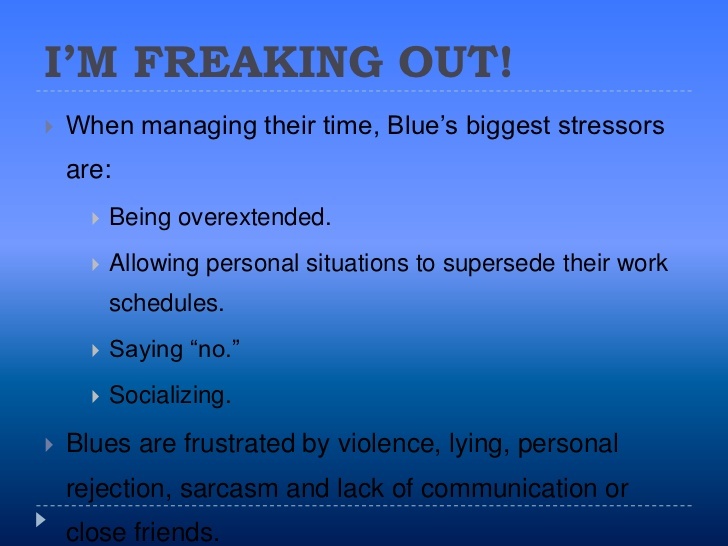 Blue has a weird way of both relaxing a person and stimulating them at the same time as well. Blue is linked with confidence and unlike the color red, which shows aggressive dominance, blue shows a calm authority instead. It can inspire trust and is non-threatening when a person is wearing. The color also helps show persistence. Blue tends to be known as a not very emotional color. It can be described as aloof or snobbish and just like being associated with intelligence, it can be associated with being cold and rational to a point of showing little emotion. When you look at food there tends to be little to no blue in them and that is because blue can be linked to an unappetizing feel. The color is known to suppress appetite and some diets suggest eating food on a blue plate since it will cause a person to eat less. The positive aspects of the color blue is the calming and safeness it brings. It is a great color to surround yourself with since it helps lower hearts, improves mental clarity, and helps inspire creativity. If you need a boost, blue can help instill confidence and trust, making it a color popular among brands. 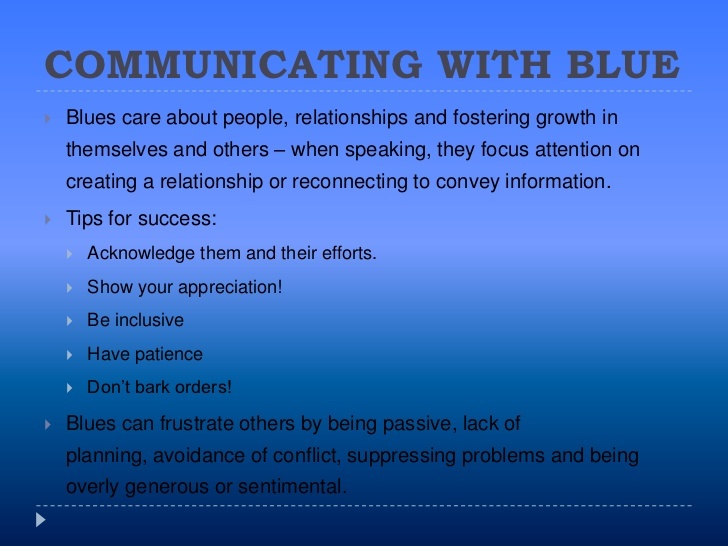 The negative aspects of blue is the fact that it causes food to be unappetizing and it is linked with snobbish behavior and it can suggest aloofness and lack of emotion. I consider myself to be a blue, but romance is something I do not have in me. So am I still a blue? And for those wondering, lack of romance has been and will be quite convenient for me, due to constant hard work (filming, teaching, researching, editing, philosophy, and a make-the-world-a-better-place project). On a side note, the psychology of colors is quite interesting to me, and I hope to incorporate it into more of my work. You are a blue, only if you are willing to dump an entire bucket of blue paint on your head. I loved this read. Really good information. I’d like to see more sources and more about the author. Would you be ok with us linking to this article? Absolutely! Feel free to link to any of our articles. Hello. I am in 9th grade. I have been researching about color psychology for 2 years. There is this one thing that I am deeply curious about, that I cannot find the answer to. When I went around information (your site as well), I found many saying that the color blue showed emotions of peace and trust, and I agree with it since blue is the color a lot of insurance and bank companies use. However, when I surveyed 60 people from my school, almost all of them answered that when they see blue, it reminds them sadness and restless. They also said green gives them the feeling of safety and trust. Could you tell me why there is a huge difference as written above between professional researches and individual ideas? I need to make a report to submit for school. I think the main factor is context. In terms of logos and brand identities, blue reflects a cool professionalism. However, if it is just on its own or used as the main color in a painting or larger work of art, that “sedating” effect can be amplified and it can cause a more serene, solemn or in some cases sad feeling. 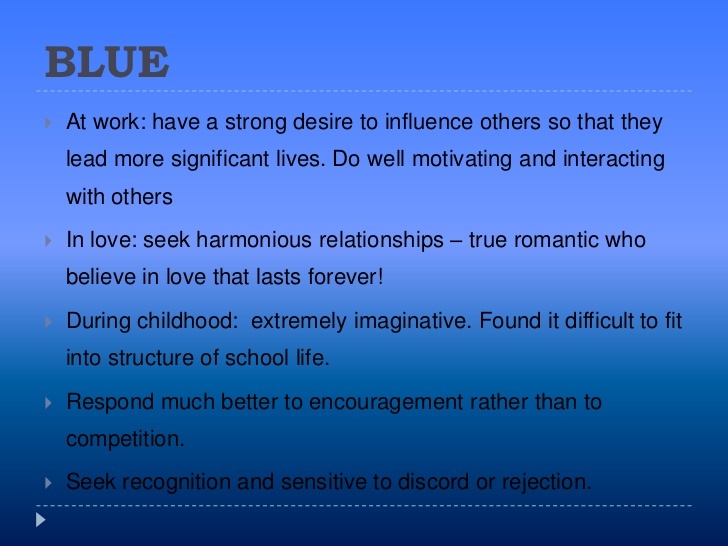 In fact, the word “blue” is sometimes used as a synonym for sad. The saturation level of color plays a role, too. Bright blue or a pleasant sky blue tend to have a more cheerful effect, while a muted or grayish-blue can be more sedating and introspective. Thanks for the article on blue, which is one of my favorite colors. I noticed that a lot of companies in the pharmaceutical and medical industry use blue, green, and white. I’m guessing this is because they all have such a strong connotation with being related to healthcare in someway. However, I’d be interested to know if there are any clinical tests that show how people positively respond to these different colors. Yes, numerous studies have been done about human color responses. One marketing study found that color helps to improve brand recognition by up to 80 percent. Studies about the color blue have linked it with creativity and tranquility. Researchers believe this is due to the associations of blue with the sky, the sea and relaxing feelings. Blue is also perceived as “competent,” which would be valuable to a healthcare company’s image. Also, numerous studies have shown people experience green as calming and connected with nature, health, sustainability and durability, while white is associated with freshness, cleanliness and hope. It’s no wonder that these colors are so often used in healthcare industry marketing. I am blue and I love it. We really want to say this. this creates a mental picture of my being…can’t disown any. Going for a BLUE cake on my birthday. A study says that with blue rooms you have better sleep quality. But which blue? Sky blue? Navy blue? Royal blue? Or any blue? I have read that only 7% of receptors in our eyes are blue sensitive which are S Cones and other L and M cones are Red and Green sensitive. The question is if our eyes are only 7% sensitive to blue how do we see every blue so loud and clear. Why don’t we miss any? Does this practically make all humans dichromatic? Blue makes you soft in the mind and submissive. Easy to persuade or influence judgment. Based on what research is this information coming from? I love blue and always have. This definition sums me up almost completely except for the social aspect and having close friends. Besides my lover/husband/best friend, I need my good friends and love to socialize a few times a month. Otherwise blue is me!!!! !